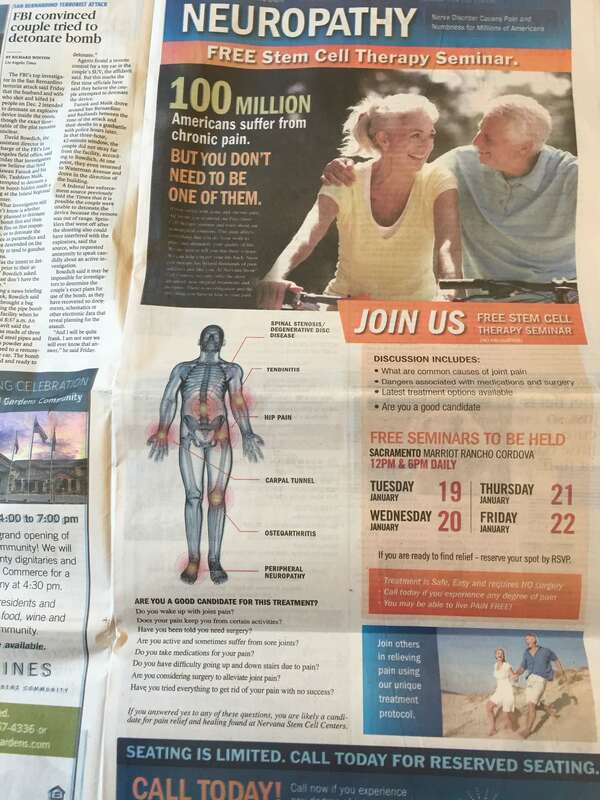 I was eating my Sunday breakfast and reading the SacBee, when a full-page ad for a stem cell clinic jumped out at me. I dropped my toast onto the plate and grabbed my iPhone to take a picture. The ad is for Nervana Stem Cell Centers in Sacramento. A little research on their website revealed that they appear to sell amniotic and fat stem cell injections for pain and joint conditions. I’m not convinced that such therapies are safe and effective, but the number of such clinics in the US is proliferating rapidly. To my knowledge, the use of stem cells in this way is not FDA approved. Just six or so months ago it seemed that another stem cell clinic had opened in Sacramento, but I’m not sure what happened to that one and if it is operational. The Nervana website does not say who the doctor(s) are behind Nervana even on their “who we are” page. A quick search using the California Secretary of State web tool found no record for a business license for Nervana, but that could well be pending or have a different name. I would imagine that the Nervana name is meant to imply Nirvana. Are you sure you didn’t drop your toast to make a call to the FDA? @Breakfast (Barbara): Yes, I have this special red phone that I can call the FDA even on Sundays…uh, no. Besides, I don’t see any evidence over the years that the FDA would listen to me even on weekdays. For heaven’s sake. Lighten up. I know it’s Sunday and Monday is a holiday so you won’t be able to call until Tuesday, but if the FDA isn’t listening to you after all these years, perhaps you could complain to the SacBee for accepting such advertising. @Breakfast, I know, I was just having a little fun. 4000 treated patients: I think this should be enough evidence for this kind of treatment? The US Government is closed down on weekends. Paul I hope you didn’t spill your coffee. I did. Cells that don’t have DNA! I mean, just watch how those little devils replicate. Another miracle, Doctors who know even less about biology than me! Ah, but it’s FDA approved, so it must be true. Otherwise, how else would they expect anyone to fall for such transparent nonsense? Thanks for the great comment and the catch of the no DNA thing…I gotta look into that. please take a look at my post above. I am very interested in this topic and I am wondering: Do you think the study with 4000 people is worthless? Or why don’t you recommend these orthopedic applications? I am just an interested potential patient, but as far as I can judge this, these therapies seem to be approved, because of 4000 treated patients. What should a patient, who is no stem cell scientist, believe? I am very interested in your opinion. Please let me know, what you think about this. This would be a great help. I just meant stem cell application for orthopedic conditions in general, not for the special clinic in your article. But after I read the article of regenexx and about their study (see my post above), I would think stem cell therapies concerning orthopedic applications at the joint are approved and safe. So please help us, Or are my thoughts wrong? There’s been many Nervana TV ads in Sacramento over the past two weeks. Thanks for the heads up. I think they are new so they are advertising a lot now. I didn’t see the TV ads. Do you remember what channel(s)? What is your impression of the ads? I’m NOT an expert. Nevertheless, I shall try to address your question, albeit very imperfectly. I think that the evidence is becoming more and more clear that some types of autologous mesenchymal stem cell treatment for some sorts of medical problems are relatively low risk compared to conventional therapies. Indeed, the evidence mounts that some types of conventional surgical treatment are both ineffective and outright harmful (meniscus surgery, being an example from my own dreadful experience and from many publications from 1948 to the present!). There is a huge problem because there are also practitioners/clinics that seem to be just jumping on a “stem cell” bandwagon without really knowing much about what they are doing. I arrive at this judgement from the blatant errors that they make. They seem not to know anything more than a layperson (like me) can figure out from 30 minutes on PubMed. I can’t help but wonder to what extent this boom of “amniotic stem cell” therapies is driven by sales representatives pushing this FDA approved product? Speaking from personal experience, I think that it’s easy to be deceived by a clever sales(wo)man. This idea of knowledge and anti-knowledge is really interesting. I hadn’t really thought of it that way until your comments. Thank you for your answer, but I think we can not discuss stem cell therapies in general. The mentioned study with data of 4000 patients seems to me enough evidence for these therapies (orthopedic stem cell therapies of the joint). I can not say something about the clinic in the ad. But I don`t understand, why Paul criticizes the orthopedic stem cell therapies?, although there seems to be a good evidence (4000 patients) for these applications. Or do you think the study is not suitable? I hope Paul will help us to understand this??? What do you think, Paul? It would be a big help, if you will answer us this question. – data of 4000 patients? So is this therapy approved, now? @Paul, what do you think? The question of Richie is for sure the crucial question? I’m no expert, but I have run a handful of clinical phase I and II trials, so I’ll try my best. “Approval” of a drug can only be granted by regulatory body (FDA, EMA and others) and approval is required in order to sell it on the market and get the costs reimbursed by the national health services. It doesn’t matter how many patients have been studied if the company didn’t make an application for approval in the first place. Regenexx, the company that Richie quoted, has just begun recruiting patients for clinical trials in osteoarthritis, anterior cruciate ligament tear and rotator cuff tear. If successful then it may be said that the drug (bone-marrow aspirate) is so far, safe for testing in further more definitive clinical trials for these illnesses. But it is not yet approved nor is it guaranteed to be safe in other diseases or at other doses or routes of administration – all of these must likewise be tested in controlled clinical trials. I would be interested in what sort of data are to presented in this advertised publication. The messages don’t say that this was an FDA clinical trial. If not, why not? FDA regulations are not onerous for legitimate trials. And, by the way, a publication doesn’t validate a therapy. If the publication is done well, it will describe the procedures in enough detail and the outcome measures sufficiently to be reproducible in other labs/clinics. If this publication does that, then the authors should have already been seeking approval from the FDA. Thank you for your answers, The publication will come soon. I hope we can discuss the publication, the results and its value later again. Because this could be a very good help for potential patients to make a hopefully good/right decision. I want to see the published paper before I can analyze what is going on there. @Thanks, Paul, the paper should be published soon, I am very interested in your opinion concerning this study. There is an active trademark for “Nervana” that is registered to a neurosurgeon named Tushar Madhu Goradia who is affiliated with Mercy San Juan Medical Center in Carmichael (a suburb of Sacramento) and lives in Fair Oaks (the next suburb over from Carmichael). The goods and services provided by “Nervana” are listed as “medical services.” “Nervana” is also listed in the National Provider Identifier Database with a legal business name of “Goradia Medical Corporation,” headquartered in Fair Oaks, and it is listed as a neurosurgery provider. The president of Goradia Medical Corporation is listed as Tushar Goradia. Interestingly, the trademark was filed in 2005 and registered in 2007. Dr. Goradia also runs or ran “Nervana Herniated Disc Specialists” in Carmichael (I don’t know if they are still around), so that may have something to do with the earlier trademark filing date. Dr. Goradia appears to be an MD PhD graduate of HST with clinical training at Hopkins; however, I can’t find any publications related to stem cells, and his research seems to have been more along the lines of mathematical modeling, although he has also filed patents for neurosurgical devices and methods. Note, however, that spinal surgeries, and especially herniated disc surgeries, are a popular target for autologous stem cell therapies, so I would not be surprised if Dr. Goradia has or had already been offering stem cell treatment through Nervana Herniated Disc Specialists, and the formation of Nervana Stem Cell Centers represents an expansion of this (or a kind of reincarnation of Nervana Herniated Disc Specialists if it is no longer around). This is my best guess for who is behind Nervana Stem Cell Centers. Thanks, Shinsakan. I’m going to try to contact Dr. Goradia tomorrow to confirm. His LinkedIn page also mentions Nervana: https://www.linkedin.com/in/tushar-goradia-333a138. Also, with the claim of “no DNA” in amniotic stem cells, I think that they really mean to say “no exogenous DNA” (i.e., the kind of DNA introduced to make iPS cells) rather than saying that the cells actually do not contain any DNA, but they just did not express themselves well. However, it is misleading and/or ignorant for them to suggest that amniotic stem cells can differentiate into any cell lineage and that cell differentiation and replacement is the main mechanism by which their therapies would have clinical benefit; this suggests a lack of cell biology expertise on their part. Amniotic stem cells may be an alternative to MSCs, however. For a recent review, see Dziadosz et al. (Am J Obstet Gynecol. 2016 Jan 5; doi: 10.1016/j.ajog.2015.12.061). Please come back to the question of Richie, when the article/study is available. Why would patients trust that the stem cells come only from amniotic fluid? There is so much room for abuse. These are the New Quacks to replace the chiropractors. @admin Were you able to talk to Dr. Goradia?